Celebrates a favorite childhood pastime—catching fireflies on a summer night—with a one-to-ten counting concept built into a charming story. Illustrated by Betsy Snyder, the pages glow with sparkling glitter accents. A great gift, or winding-down-at-bedtime selection, for grownups and little ones to share.Part glittery counting book, part endearing daddy-daughter story! 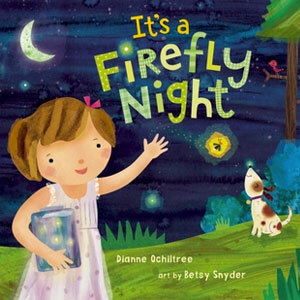 A favorite childhood activity—catching fireflies—glows from the pages of this story. Lilting rhymes chronicle a little girl’s capture and release of fireflies, one by one, capped off by a collection of fascinating firefly facts.